Like Weber's pulpy debut novel Lookin' for Luv, this crudely written romance seems condemned to advertise its author's limitations, offering virtually no meaningful insight into the serious problems his cardboard cutout characters face. "Black people are treated differently than white people," one of them opines, and that's about as shrewd as it gets. Successful businessman Kyle was the first of a group of four New York City bachelors to wed, and he took a white wife. Now in their mid-30s, Kyle's buddies Jay, Wil and Allen rush to his side as he is falsely jailed by racist cops for the attempted murder of an elderly woman. Mama's boy Allen is caught between his shady, mercenary girlfriend, Rose, and his demanding mother. A compulsive womanizer, egocentric Jay flaunts his disrespect by neglecting his wife, Kenya, and their baby daughter. Wil reluctantly covers for him, but his wife, Diane, is a snoop who is constantly stirring up trouble. Kyle suffers from impotence and his shrink says the trauma of his arrest triggered a subconscious fear of being married to a white woman. Even Viagra doesn't help, so Kyle goes off to Africa to find himself. Meanwhile, opportunist Rose bullies Allen into marriage and manipulates both him and his mother into taking out insurance policies with her as beneficiary. Predictably, Ma is murdered during a holdup. 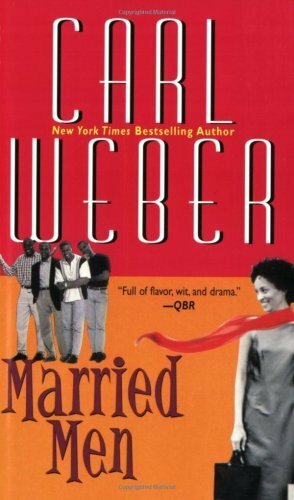 Weber fails to evoke any sympathy at all for his cast of stereotypical, shallow characters as they blunder through this soap opera. "I played dumb," one character says, unwittingly speaking for all concerned. They're not playing. Agent, Marie Brown. 10-city author tour. (Sept. 4)Forecast: Despite its lowest-common-denominator approach, the book may appeal to those who sent Lookin' for Luv into a fourth printing. Weber, recently named African-American Bookseller of the Year, will be a force in driving sales.